Global volatility is picking up as China’s stock market continues to weaken. The world’s second largest economy disappointed on its GDP number this week despite being north of 6%. Throw in some trade tensions and Shanghai’s stock market gets messy. It was only a matter of time before the other developed countries began to push back on China’s trade practices and theft of intellectual property (its not just the USA). 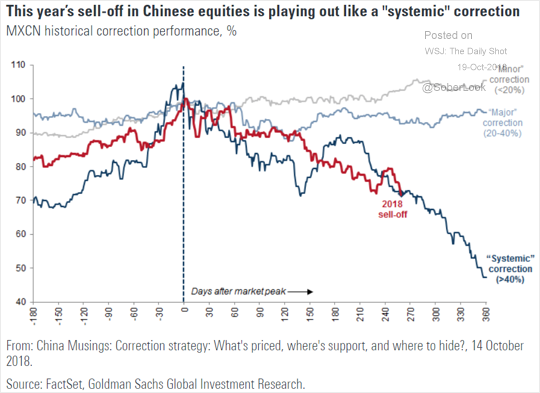 The Chinese markets are largely untested when it comes to bear markets and recessions and I am not sure how the government will react if their financial system is tested like the rest of the world was in 2008. One thing is clear, China is too big to be ignored so if they catch a cold it will spill into the other developed countries and their stock markets. Interest rates are a big factor when it comes to currency valuations and who wins in trade wars so the Fed does have a hand in all of this that is all too visible. 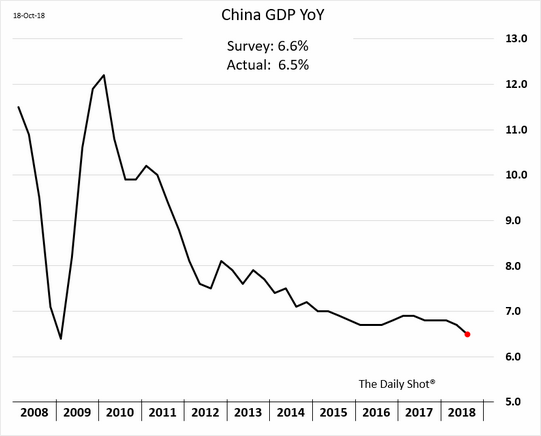 The Fed will go too far with their tightening policy which has its consequences for China as they are forced to devalue their currency to keep up their exports which more or less act as their jobs program. 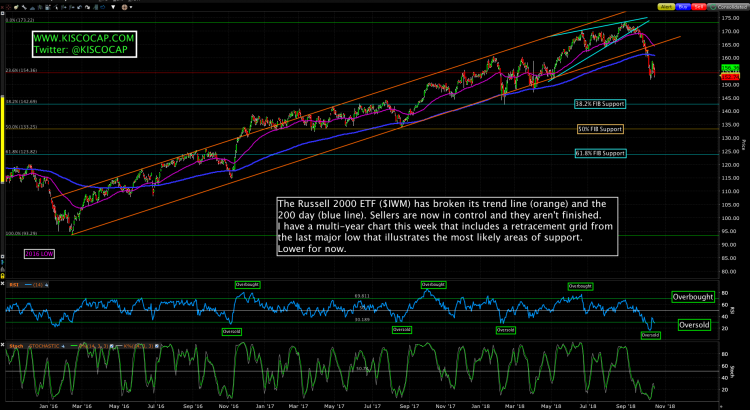 The Russell 2000 (growth companies) continues to look weak and is likely to continue its decline into the coming weeks. The S&P 500 is hanging on by a thread and looks vulnerable. US equities were largely unchanged this past week but there are sectors like financials, homebuilders and semiconductors that are showing warning signs of oncoming weakness. Friday’s price action was largely left on a sour note so price-action early next week will be closely watched by market technicians. The 10YR is on the rise again pushing up on 3.2%. Closing above 3.25% would warn a move towards 3.5% in the coming weeks. 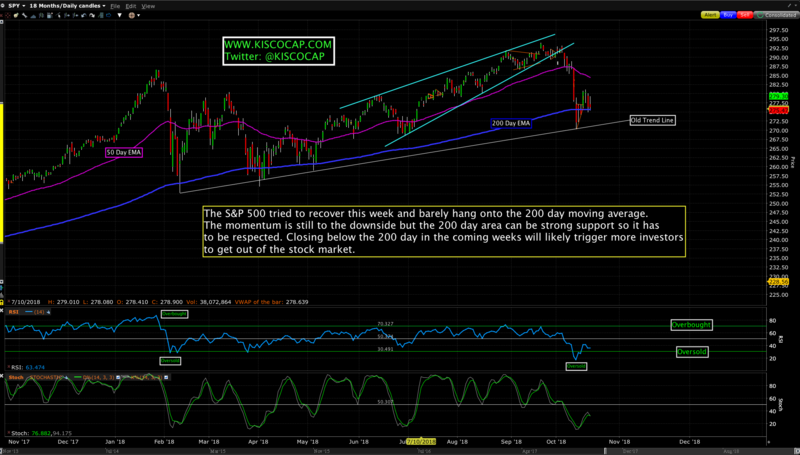 The S&P 500 needs to hold its 200 day or it goes lower. 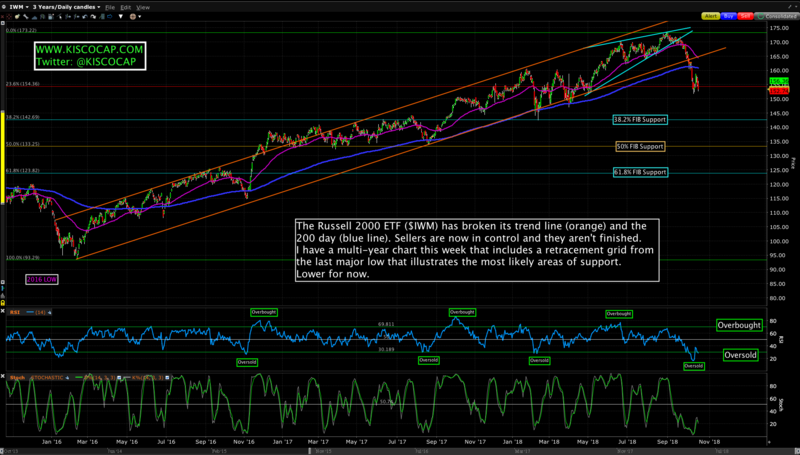 The Russell 2000 should continue lower in the coming sessions. An acceleration lower could drag the other indices down with it. 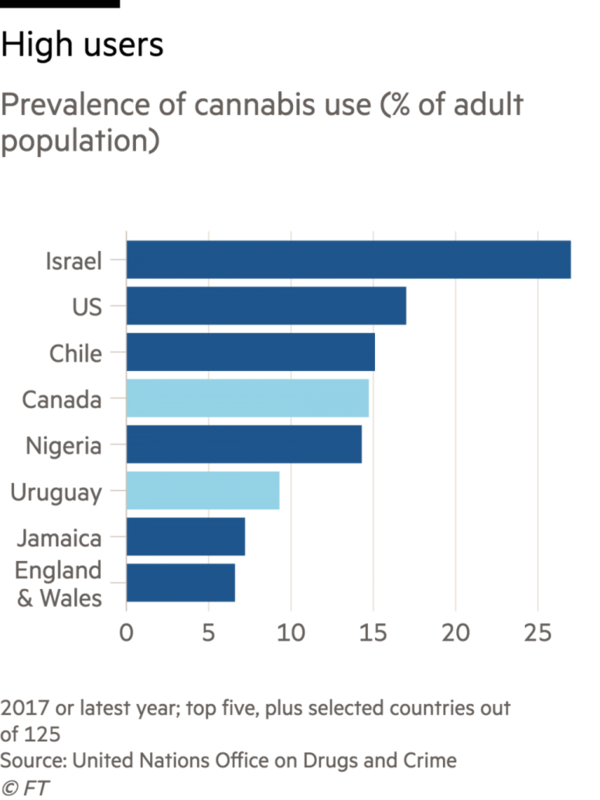 On Wednesday Canada became only the second country after Uruguay to legalise recreational marijuana. 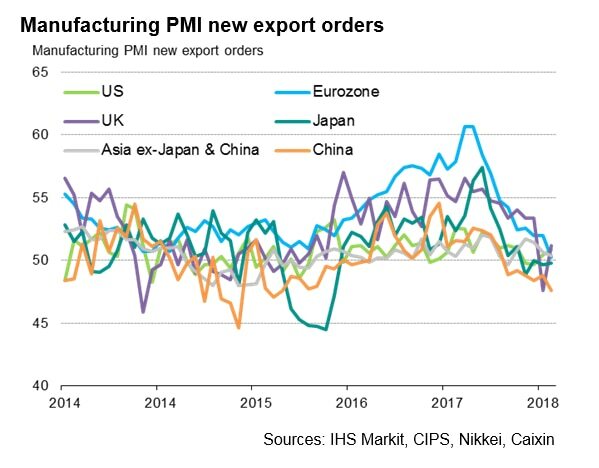 Worldwide manufacturers reported the first fall in global export orders in over two years according to the latest PMI surveys. The slowdown in trade acted as a further drag on factory output, order book growth and hiring. 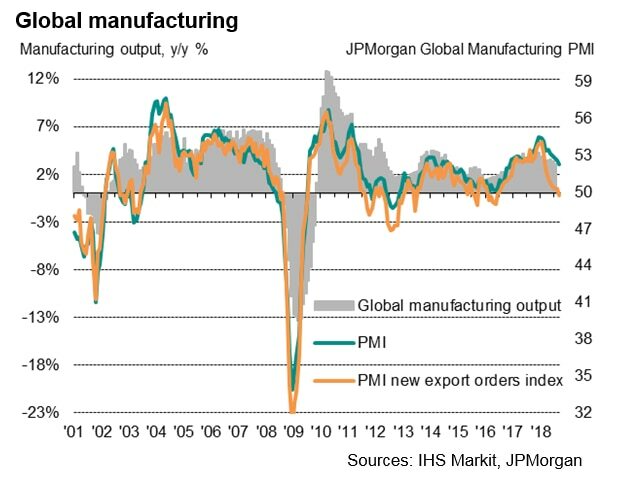 Price pressures, purchasing activity growth and supply constraints also cooled in a reflection of the wider easing in worldwide manufacturing growth. The export decline was most evident in Asia, though showed signs of becoming increasingly broad based across the developed and emerging markets. Measured across all emerging markets, exports fell at the fastest rate since June 2016, while exports from developed world manufacturers showed the smallest – only marginal – increase since May 2016. Federal Reserve officials signaled they see a strong economy justifying continued interest-rate increases and said they will watch for evidence their moves are keeping economic growth on an even keel, minutes of their September policy meeting showed. The minutes, released Wednesday after a three-week lag, follow several weeks of effort by Fed officials to emphasize uncertainty about the precise level of interest rates that will neither spur nor slow growth, a destination favored right now by most officials. Japan’s exports fell for the first time in close to two years in September, with shipments to major trading partners including both the US and China contracting. Those to Western Europe also fell 9.4%. European stocks slipped on Friday after a series of disappointing earning results in the car and construction sectors. The Europe-wide Stoxx 600 index was down 0.5%, dragged down by weak results from Michelin and the French conglomerate Bouygues which reignited investors’ concerns about carmakers and construction stocks. Shares in tire manufacturer Michelin were down 7% after the company cut its forecast for the financial year on the back of a sales slowdown caused by weaker vehicle demand in China and new EU emissions standards. Uber Technologies recently received proposals from Wall Street banks valuing the ride-hailing company at $120 billion for an IPO that could take place early next year. That figure is nearly double Uber’s valuation in a fundraising round just two months ago and more than General Motors, Ford and Fiat Chrysler are worth combined. DowDuPont, the chemicals group formed in a $130bn merger last year, has announced a $4.6bn non-cash writedown and warned it had been forced to reduce its long-term forecasts of revenues and profitability in its agriculture division, which it plans to spin off as a separate company next year. It put part of the blame on pressures on farmers’ incomes caused by falling commodity prices and high grain inventories, which it said would result in “shifts to lower technologies and pricing pressure”.